Dr Sandy McKinnon, Investment Director at Techstart NI; Daniel Crawford, Founder of Axial 3D and Caroline McGoran, Head of Investment and Enterprise at Ulster University. 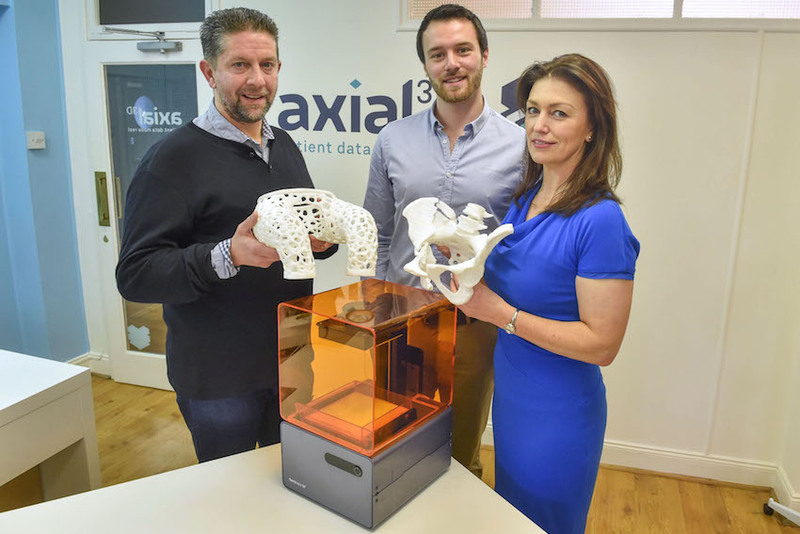 Established in 2014 by Daniel Crawford, a biomedical engineering graduate from Ulster University, Axial 3D has already revolutionised the UK market by manufacturing orthopaedic models for the medical industry. Using 3D printing technology, Axial 3D uses patients' CT and MRI scans to manufacture individual scaled 3D models of the injuries. Surgeons use these patient-specific models to practice and plan procedures, which saves valuable time in the operating theatre, while also giving their patients a much more comprehensive insight into injuries. The funding will be used to expand Axial 3D's customer base in the private and public healthcare sectors outside UK and Ireland, initially focusing on Scandinavia and Germany followed by the United States. Daniel Crawford, Founder of Axial 3D said: "Having developed the service only one year ago, Axial 3D has gone from strength to strength. My biomedical engineering degree and previous experience working for an Ulster University spin-out specialising in medical technology, has given me a great understanding of what it takes to bring a medical product from research lab to market. "With healthcare budgets under increasing pressure, Axial 3D can help surgeons to minimise time spent in surgery. This can decrease the risk of complications and reduce the time a patient spends in hospital, saving healthcare providers up to £5000 on postoperative care for each patient. "This substantial investment will help develop my export expansion strategy for Axial 3D, providing the start-up with the necessary capital to expand its customer base outside the UK and Ireland, and to diversify services into other areas of medicine." Caroline McGoran, Head of Investment and Enterprise at Ulster University said: "Axial 3D is already working with surgeons in the Belfast and South Eastern Trust, as well in local private hospitals, who are championing the benefits of the technology. The University is committed to driving innovation and developing start-ups with both practical advice and financial support. This investment will be the launching pad the company needs to drive its growth in global markets." Mr Jim Ballard, Consultant Orthopaedic Surgeon at the Royal Belfast Hospital for Sick Children said: "There are significant benefits of having a scale model of a patients' injury. It provides a much better insight into how to treat patients as well as allowing us to prepare the equipment before going into surgery, greatly improving the efficacy and reducing the risk of complications." Dr Sandy McKinnon, Investment Director at Techstart NI added: "Daniel and his team have built a collaboration platform that surgeons can use with minimal disruption to their current work practices and crucially have developed it to allow easy integration into current NHS IT systems so that access to the benefits of these sorts of models should soon be available to everyone."